By Keith Cowing on October 22, 2012 11:19 AM. "In 2008, the U.S. Government Accountability Office had identified poor planning around the looming space shuttle retirement and its follow-on program as one of 13 "urgent issues" that any new president would have to confront when they came into office in 2009. Because of years of mismatch between vision and resources, the independent Augustine commission found that the Constellation program was not viable under any feasible budget scenario. Members of Congress from both sides of the aisle agreed. Rather than walking away, President Obama knew we had to do better and laid out an ambitious new agenda of human and scientific missions that promise to take NASA and America's space program to historic new heights." "Unfortunately, American leadership is in jeopardy. Today we have a space program befitting a president who rejects American exceptionalism, apologizes for America and believes we should be just another nation with a flag. President Barack Obama has put us on a path that cedes our global position as the unequivocal leader in space. For the first time since the dawn of the Space Age, America has chosen to forgo its own capabilities for putting astronauts into space and instead relies on the Russians. The space shuttle's planned retirement was known on the day President Obama took office, yet the earliest that Americans will again ride American rockets into space is 2016." Keith's note: What a pair of memory-challenged hypocrites. Its rather odd that Space Adventures CEO Anderson would be party to such comments. in April 2010, when he was Chairman of the Commercial Spaceflight Federation, Anderson is quoted as saying the following about the Obama Administration's space policy: "This visionary plan is a master stroke. It's exactly what NASA needs in order to continue to lead the world in space exploration in the 21st century." In May 2012, on the occasion of the first launch of the SpaceX Dragon, CSF Chairman Anderson is again quoted, saying "This is a testament to the viability of the commercial spaceflight industry ... Congratulations to SpaceX for successfully completing the first steps of this demonstration flight. Elon and his team's success today is an important milestone in achieving a sustainable space program." That's quite a reversal in opinion for Mr. Anderson given what he is quoted as having said before. Curiously CSF hasn't changed their stance and Anderson continues to serve on their board. Its also rather curious that Anderson would be against flying American astronauts (for a fee) on board Russian Soyuz spacecraft and also a plan whereby American commercial vendors (such as SpaceX) would be used to fly cargo and eventually future American crews to the ISS given that Anderson's company has been taking money from rich Americans to buy seats on the very same Russian Soyuz spacecraft to the ISS. Indeed each sale his company facilitates results in a large check being written to Russian companies. How is that helping the U.S. commercial launch sector? - especially when Gov. Romney has already identified Russia as being "without question our number one geopolitical foe." Scott Pace's comments evidence total amnesia on his part. Regardless of whether you think it was a good or bad idea, the plan to retire the Space Shuttle and rely upon Russia to transport Americans to the ISS for a number of years was put in place by the Bush Administration - not the Obama Administration. After working in the Bush White House to develop that policy, Scott Pace spent 4 years with Mike Griffin at NASA during the Bush Administration implementing this policy. FYI I am told this phenomenon has become known as "Romnesia"
Pace and Anderson lament a gap between Shuttle retirement and first possible U.S. access to space in 2016 yet that date was already accepted as fact for Orion/Constellation while Pace and Mike Griffin were still running NASA. Indeed 2018 was cited as a more realistic estimate. As for the commercial access to space being pursued by SpaceX and others, Mike Griffin (one would assume with Scott Pace's agreement) signed a number of agreements with private companies to bolster their involvement with NAS A including this one with SpaceX and Orbital in 2008. In other words Scott Pace and Eric Anderson were most certainly for the things that the Obama Administration has been doing - before they were against them. Where's My Moon? Where is USAService.org? By Keith Cowing on March 1, 2010 2:09 PM. Reader note: A few days ago I again saw the "Step Forward" commercial that was run a lot after Obama was elected with its notable quote "Where's my moon" on TV. The commercial indicates we are to go to USAService.org I did so in hopes of obtaining some inspiration. I wound up at http://www.inauguralstore.com/. I could only laugh! Try it for yourself. By Frank Sietzen on April 16, 2009 11:24 AM. Honeywell lead the defense/aerospace sector with a total contributions of $2.5 million. Lockheed was right behind at $1.6 million and Boeing in third place at $1.3 million. Interestingly enough, their contributions were almost evenly divided between Dems and the GOP, with Dems slightly ahead in the dollars donated. Of course, from the perspective of the aerospace giants, this just makes good (political) sense. But how do readers think change will come about if the status quo is so well represented? By Keith Cowing on November 5, 2008 10:43 AM. "Republican Pete Olson is celebrating his success returning a heavily Republican, suburban Houston congressional district to GOP control. Olson ousted Democratic Rep. Nick Lampson in Tuesday's election." "I got licked," Feeney said in a short concession speech to supporters, some of whom were in tears. "There are differences between me and Kosmas, but I wish her well." "After one of the most contentious congressional races in recent history, the 5th Congressional District has a new U.S. representative in Parker Griffith." By Keith Cowing on November 4, 2008 1:49 PM. "It is has been a hard 8 years for NASA. President Bush's initial mistake was to downsize, outsource, and undermine the technical independence of NASA's civil-servant workforce. The Republican plan was to eliminate about a fifth of its independent in-house experts and most civil-service protections. This nave ideology, that federal laboratories such as NASA should be run like a private business with the cold, untechnical perspective of a bean-counter, tragically contributed to the Columbia disaster and led to the subsequent hurried and flawed planning for President Bush's Vision for Space Exploration." By Keith Cowing on October 30, 2008 9:28 PM. "On Saturday, November 1, former Apollo crew member Rusty Schweickart will launch final canvassing and Get Out the Vote efforts for the Obama-Biden campaign. Schweikart will then join the Obamanauts - Space Coast residents who support Barack Obama - along with hundreds of volunteers from every corner of the state to knock on doors this weekend to personally contact thousands of voters before Election Day and encourage them to take advantage of the last days of early voting." "Responding largely to concerns voiced by Florida's voters, Senator Obama has offered an unambiguous pledge to right-size NASA's budget. But his space policy is not devoted solely to NASA; it points to an Obama Administration's support for space commercialization, space workforce retention, space research and technology development, national security space programs, space-based environmental monitoring, and using space to inspire our nation's youth to excel in math and science." By Keith Cowing on October 30, 2008 11:04 AM. "I will freeze government spending on all but the most important programs like defense, veterans care, NASA, Social Security and health care until we scrub every single government program and get rid of the ones that aren't working for the American people. And I will veto every single pork barrel bill Congresses passes." "Days after attempting to clarify his ever-changing position on space funding, John McCain returned to the region this morning and reinstituted his call for a spending freeze - without an exception for NASA. Speaking in Ormond Beach, McCain promised to freeze spending on "all but the most important programs like defense, veterans care, social security and health care," pledging to "veto every single pork barrel earmark." Notably absent was any exception for space funding, muddying a position McCain tried to clear up last week." By Keith Cowing on October 29, 2008 11:07 AM. "Somewhere in America today, there's a 10-year-old girl who could be the first person to walk on Mars. She's probably playing with a toy chemistry set or a kid's telescope right now, gazing up at the heavens and dreaming big dreams. I know a lot about that girl because in 1961, during the inspirational early days of our space program, that was me. The world that girl will enter, and in particular the state of our space and science industries, is different for her than it was for me. In some ways, she has greater opportunities. While still unacceptably behind men, women have more avenues to becoming scientists today than they did when I answered a call in a newspaper ad to become an astronaut. In other ways, our space program has lost the national stature it had when I was growing up. In both regards, though, we can and must do better." By Keith Cowing on October 28, 2008 11:41 PM. Editor's note: We all know by now that Mike Griffin prefers to call himself "Spock" (audio). But who does the REAL Spock (Leonard Nimoy) prefer in election 2008? Listen to this excerpt from a recent appearance by Nimoy and you will hear about an encounter between Barack Obama and Nimoy a while back - and yes, Obama does the Vulcan salute. Hmmm ... does this have any bearing upon space policy under a possible Obama administration? Continue reading Obama Prefers Spock - The REAL One. By Keith Cowing on October 28, 2008 10:26 PM. "When John F. Kennedy challenged the nation to go to the moon, he noted that the space industry not only demanded the best minds, it also created the best jobs. Ladies and gentlemen, the objective was not just to go to the moon. But it was to get another 435,000 engineers and scientists and mathematicians. When the Shuttle is retired, NASA estimates that 3,500 jobs could be lost - and that doesn't count the impact on local businesses or the long-term cost of allowing our global leadership to atrophy. The Bush Administration has left our space program in a very difficult position. And John McCain, as Chairman of the Commerce Committee hasn't helped. He oversaw the plan to retire the Space Shuttle before a replacement was ready." By Keith Cowing on October 23, 2008 12:53 PM. By Keith Cowing on October 23, 2008 12:25 AM. Editor's note: I wrote this about a month ago. Last Fall we celebrated NASA's 50th anniversary. When you celebrate such events you always look back - and look forward. NASA is made of people - and people pause and reflect. NASA is no different. As we look back at NASA's history we see stunning accomplishments, difficult challenges, heartbreaks, roaring resurgence, and continued exploration. Yet as with any human endeavor, reaching age 50 calls for some introspection and some re-prioritization. In 2004 NASA was given an opportunity it had not had for a generation - a new commitment to the human exploration of other worlds. This happened barely a year after the agency suffered the tragic loss of Columbia and her crew. The President of the United States of America came to NASA to give the agency its new "vision". With a renewed commitment to explore, NASA set forth to develop the plans and hardware needed to implement this new era of human exploration. However, within a short time, NASA fell back on bad habits. Discarding the wisdom of the marketplace and a bounty of external ideas, it discarded this advice, and picked an architecture that relied upon re-designing existing hardware under the guise of reusing it. And there was no back up plan in case things did not work out. All too soon, things did not work out and America's replacement for the Space Shuttle's crew carrying capability slipped further into the future. The gap between the retirement of the Space Shuttle and its replacement grew when the wisest course would have been to shrink it - indeed, to eliminate it. Continue reading A Speech That I'd Like To See The Next President Deliver. By Keith Cowing on October 22, 2008 11:55 PM. "As a child, I remember sitting on my grandfather's shoulders and watching the Apollo astronauts return from a splashdown to Hickam Air Force Base, dreaming of where they had been. It inspired my imagination and gave me confidence in what we as Americans could achieve. It's time for a space program that inspires our children again. As President, I will lead our space program boldly into the 21st Century - so when my daughters, and all our children, look up to the skies, they see Americans leading the way into the deepest reaches of our solar system." By Keith Cowing on October 20, 2008 3:00 PM. "Obama also released a radio spot in Florida Thursday accusing McCain of wanting to cut NASA funding, an argument that turns on McCain's proposal to enact a spending freeze to close the budget deficit. McCain "wants to freeze NASA spending at last year's level," says Sen. Bill Nelson, D-Fla., in the ad. "So layoffs would loom larger, and NASA would continue to be starved of funds for future exploration." By Keith Cowing on October 18, 2008 6:11 PM. "Sen. John McCain came to the space coast today and promised $2 billion to help NASA transition from the space shuttle to a new space vehicle. "I've always been a strong supporter of manned space flight and NASA," he said in a community that is home to many in the field. "If I'm elected president I won't cut NASA funds like Sen. Obama." McCain aides noted that Obama, the Democratic presidential nominee, had promised to pay for education programs by delaying the Constellation space program, which is meant to fill the gap to the next space vehicle, only to backtrack later." "The Obama campaign immediately seized on what it said was a change in McCain's space stance. "One day it's a spending freeze; the next day it's not; but whatever his stance is, Space Coast voters are looking for a change from the Bush-McCain policies that brought us to the brink of thousands of job losses," Obama spokeswoman Adrianne Marsh said." By Keith Cowing on October 17, 2008 6:25 PM. "Sen. Nelson: Well, as we speak, John McCain has left Miami and he's en route to my home town of Melbourne. And the fact that he's going to Brevard County is an indication that he is quite concerned that Barack has really sliced in to that traditionally Republican area, because Barack has a very detailed proposal on America's space program, and John McCain has had a proposal, as he said two nights ago in the debate, of a freeze at last year's levels across the board. And, of course, if they do that with NASA, it will absolutely continue to savage NASA, as George Bush's administration has done, that's leading us at the space center, when they shut down the space shuttle, to 4,000 to 5,000 jobs laying off because they have not developed the new rocket to replace the space shuttle, and we're going to be beholden to the Russians to get to the very space station that we built and paid for, and -- and -- and without an American vehicle for five to six years. Barack has addressed this. And I submit to you that that's exactly why McCain is going to Brevard County, which went heavily for George Bush over John Kerry , and he's going in there because he knows that -- that Barack has -- has absolutely pierced those Republican engineers who are so concerned about America's space program." By Keith Cowing on October 9, 2008 6:51 PM. "Barack Obama launched a new national television ad today that prominently features Apollo Astronauts as Obama recounts how they inspired his early days. In the 60-second ad entitled "Buster," Obama speaks directly to the camera about the lessons he learned from the early space program and what it taught him about America. The ad is the first by either presidential candidate to highlight the space program. Obama has pledged to increase NASA funding to save Florida jobs and maintain America's leadership in space. Senator McCain has pledged to freeze discretionary spending in his first year, which would negatively impact the space program." By Keith Cowing on October 8, 2008 10:31 PM. "Number two, look what John wants to do with the space program. He wants to essentially put it on ice. I think it is clear, Florida is hurting." By Keith Cowing on October 8, 2008 5:19 PM. Reader note: "I hope you will write a post on this tidbit of ludditery from McCain at tonight's Presidential debate. Senator McCain said Sen. Obama supported a congressional earmark of "$3 million for an overhead projector at a planetarium in Chicago, Ill. My friends, do we need to spend that kind of money?" The Adler Planetarium to which Sen. McCain refers is one of our key education and public outreach partners for many NASA projects. Sen. McCain's criticism of the heart of the Adler Planetarium is anti-science, threatening to kill off one of the best ways we have to communicate the scientific results of a NASA mission to the public. The suggestion that this is somehow just an overpriced tranparency projector is disengenous at best." "Adler Planetarium, to support replacement of its projector and related equipment, $3,000,000 - One of its most popular attractions and teaching tools at the Adler Planetarium is the Sky Theater. The projection equipment in this theater is 40 years old, and is no longer supported with parts or service by the manufacturer. It has begun to fail, leaving the theater dark and groups of school students and other interested museum-goers without this very valuable and exciting learning experience." By Keith Cowing on October 7, 2008 7:40 PM. "WEDNESDAY, October 8, engineers and other space industry workers will hold a press conference to denounce Senator John McCain's plan to freeze NASA spending and his Republican Party's attack on the space program. The Republicans' criticism of Senator Barack Obama's $2 billion plan to save space industry jobs comes as NASA Administrator and Republican appointee Dr. Michael Griffin thanked Senator Obama personally for his "leadership" in getting critical legislation passed to help maintain an American presence in space. 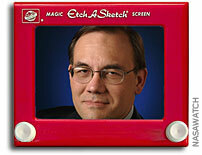 Griffin wrote to Obama: "without your leadership, this would not have happened." By Keith Cowing on October 7, 2008 3:07 PM. "NASA confirmed that Dr. Griffin sent the note, which first appeared on the website nasawatch.com, but added that he sent similar letters to other members of Congress. ... With the economy tipping precariously, was Dr. Griffin trying to ensure that at least one employee of the space agency would remain in his job in January? It does not sound like the Griffin style, frankly -- he is an engineer, not a Washington schmoozer, and when asked to describe his feelings early in his tenure, replied, ""I don't do feelings. Just think of me as Spock"
By Keith Cowing on October 6, 2008 4:07 PM. "Obama Has Proposed $2 Billion In Additional NASA Funding. "Sen. Barack Obama has detailed a comprehensive space plan that includes $2 billion in new funding to reinvigorate NASA and a promise to make space exploration and science a significantly higher priority if he is elected president." (Marc Kaufman, "Obama Suggests $2 Billion In New Funding For NASA," The Washington Post, 8/19/08)"
"As President, John McCain will - Ensure that space exploration is top priority and that the U.S. remains a leader; - Commit to funding the NASA Constellation program to ensure it has the resources it needs to begin a new era of human space exploration. - Review and explore all options to ensure U.S. access to space by minimizing the gap between the termination of the Space Shuttle and the availability of its replacement vehicle; ..."
Editor's note: The Washington post article that the RNC quotes also says "While Obama's ambitious plan embraces President Bush's 2004 "vision" to send astronauts to the moon by 2020 and later to Mars -- a plan McCain co-sponsored in the Senate -- the Democratic presidential candidate said the administration's "poor planning and inadequate funding" have undermined the effort and jeopardized U.S. leadership in space." "Democratic U.S. Sen. Bill Nelson of Florida said the Republican National Committee "just stepped in it" when they blasted Barack Obama for his promise to give NASA $2 billion more in funding. "It's not only ridiculous, it shows how totally out of it they are," said Nelson, who said extra NASA funding helps grow jobs in Florida, home to the Kennedy Space Center and a key swing state in the upcoming presidential election. "They simply don't know what they are talking about." By Keith Cowing on October 6, 2008 1:34 PM. Editor's note: Former NASA PAO flack Patti Phillips is clearly losing it over at the Washington Examiner. She uses a post about Obama and space policy to launch off on a bizzare path that ends with Nazis. Sure, Patti's over the top rant at Obama is just that. But the link to a video she includes - a video that overtly uses Nazi symbology and swastikas in comparison to the campaign banners used by the Obama campaign and overlays films of Hitler youth with audio of children signing an Obama campaign song - is just plain obscene and has no place in civilized discussion. She introduces the video by saying "You decide if the Obama truth squads, youth squads, and hype are bringing some horrific history back to life. Here's a provocative YouTube video that wraps up some current issues." What was this woman thinking? Editor's update: This just appeared online at the Examiner: "Note: at the request of an Examiner editor, who had concerns about the harshness of the comments posted in response, the video has been removed." "Harshness"? The YouTube video "Obama Youth Revolution - Sing For Socialism" that Patti Phillips thought was appropriate is outright racist. Patti did not have the common morals to see that this video was outright inappropropriate - but her editor did. This is what the page looked like before. Note that the title "Obama builds up the rubber in his space flip flops, truth squads, and kid allegiance squads" is now simply "Obama builds up the rubber in his space flip flops". Look at the URL for the story "http://www.examiner.com/x-504-Space-News-Examiner~y2008m10d6-Obama-builds-up-the-rubber-in-his-space-flip-flops-truth-squads-and-kid-allegiance-squads". Also, removed are the allusions to Hitlerian tactics, the video, and outraged reader comments. Let's just pretend that this never happend, eh Patti? I wonder what Patti will come up with next as she tries to link space policy to an ever-increasing array of partisan and bizzare topics. By Keith Cowing on October 5, 2008 5:55 PM. "Senator Barack Obama issued the following statement today on World Space Week and the 50th Anniversary of the inception of NASA: "This week, we join more than 50 nations around the world in celebrating World Space Week. And this year, as we mark the 50th anniversary of NASA, our space program is at a crossroads. As other countries are moving forward in space, my opponent's vision would cause us to fall unacceptably behind. His pledge to freeze all discretionary spending for programs other than veterans and defense would assure the loss of thousands of jobs in Florida, and seriously threaten America's leadership in space. I have a different vision. My plan to revitalize our space program will reduce the gap between the Space Shuttle's retirement and its next-generation replacement; and we'll increase funding for a robust human space exploration program and research that pushes the very boundaries of discovery." By Keith Cowing on October 1, 2008 6:20 PM. "ORLANDO - TODAY, speaking in Orlando and Fort Pierce, President Bill Clinton spoke to Floridians about reasons a Barack Obama and Joe Biden administration would benefit Americans. The former President strongly supported Obama's policies on the economy, energy independence and health care. Possibly the most salient of issues for Floridians was the former President's support of Barack Obama's vision for a robust space program. "He has a plan to support the space industry, which I think is important not just to Florida but to America. This is a very big deal," said Clinton during his speech in Orlando. "We have a vested interest in staying on the frontiers of technological change and many of the answers to our environmental and other challenges will be found by continuing the push into space." By Keith Cowing on September 24, 2008 6:22 PM. "Silly me. When I embarked on this freelance journalism project to chase down strings of rationality in the race for the U.S. presidency, using the space program as my fishing reel, I made a bad assumption. I thought rationality MATTERED to all people. You know? Fact-gathering, logical reasoning, analysis, verification the processes of science? Please stop chuckling. I know I should have known better. So forget about the LOGICAL thing to do for NASA, let alone the country. I've realized what counts most in our society is a good story. We love drama. If it was our gross domestic product, we'd have so much money Sarah Palin would be writing us checks from the Treasury, just like they do with oil revenue in Alaska." By Keith Cowing on September 18, 2008 12:13 AM. "The meeting is closed, definitely closed, and that is not going to change," said Alexis Allen, a spokeswoman for Aerospace Industries Association, a trade industry group. "I think there has been a lot of public debate and not every forum has to be a public event." Editor's note: What is the AIA afraid of? An informed electorate? By Keith Cowing on September 17, 2008 3:54 PM. "The report recommends that the president and Senate accelerate the appointment process for S&T leadership to reduce the personal and financial burdens on nominees and to allow important positions to be filled swiftly. Congress and the Office of Government Ethics should simplify procedures aimed at avoiding conflicts of interest in appointees, which have become unduly complex over the years. And scientific and professional societies should more actively reach out to the president's science adviser and other senior administration leaders to provide input that broadens the pool of candidates for appointments." By Keith Cowing on September 15, 2008 10:22 AM. "Entering the debate on several contentious science issues, John McCain today answered the "14 top science questions facing America," according to ScienceDebate2008.com, the group leading an effort to make science issues a larger part of the election. His answers join those of Barack Obama, who answered the same questions two weeks ago. Recent national polls have shown that 85% of voters would like the see the candidates debate these challenges, and the majority of voters are much more likely to vote for a candidate that has a plan for tackling these issues." By Keith Cowing on May 31, 2008 11:00 AM. "Half of the four people on the panel were able to talk about space policy quite well: Lori Garver, representing Clinton, was well-versed in the issues, not surprising; OBrien has also done his homework, based on the questions he asked on topics beyond NASAs budget and the future of the vision, ranging from commercialization to military space policy to export control." By Keith Cowing on May 30, 2008 12:16 PM. "What will happen to the International Space Station while NASA transitions from the Space Shuttle, retiring in 2010, to the Orion spacecraft, launching in 2014? The National Space Society considers this question and others during its 27th annual conference today in Washington, D.C."
Editor's note: Live C-SPAN coverage resumes at 2:00 pm EDT today with a discussion on space and the 2008 Election. 1. We need to build/support a strong pool of talented people to ensure the future of space research and to ensure a supply engineers of tomorrow. Inspiration takes many forms. My boss has not talked about space - and when he does he will talk about it in an inspirational way. 2. We need to create a supportive environment for research and development in both the public and private sector - including support for a a new generation of entrepreneurs. 3. Need to apply science, technology, and engineering to solve the world's greatest challenges. 4. Need to be linking human and robotic exploration of space more clearly to challenges that face our planet such as climate change and to provide unadulterated scientific advice to the government. Steve Robinson suggested that there are other things that are done by robots in space that can be inspiring and that humans do not necessarily need to be there (although e personally find that inspiring). Moderator Miles O'Brien suggested that there are "no high schools named after robots". Robinson replied "some of those high schools are building robots". He elaborated that it might be more inspiring for his students (he's a teacher) to create ways to interact with rovers on Mars. "We should not limit our inspiration to what inspires us. I am not inspired by Second Life but others are." By Keith Cowing on May 24, 2008 10:06 AM. "I'm very pleased to announce that for the first time, The Netroots Nation (Yearly Kos) Convention will feature a panel on space policy, July 18th or 19th in Austin, Texas. The panel, entitled, "Progressive NASA & Space Policy Under a New Administration," is an opportunity to bring critical space policy issues to light within a potent progressive political constituency- the Netroots- that hasn't historically paid much attention to space. It is also an opportunity for the Netroots to weigh in on what a new progressive space policy agenda could be under a progressive Administration in 2009." By Keith Cowing on May 23, 2008 8:46 AM. "Now I know we're transitioning from the shuttle to the Orion program and I am fully committed to making sure that is funded. But I want to review with NASA what are we doing in terms of manned flights to the moon or to Mars vs. are we better off using things like Hubble that yields us more information and better bang for the buck. The bottom line is I am absolute committed to making sure we have a space program that is second to none in the world. That's my absolute commitment. But I want to sit down with NASA and figure out what's our focus and make sure that that focus is clear and yielding the kind of benefits over time. I want us to understand what it is we're trying to accomplish." 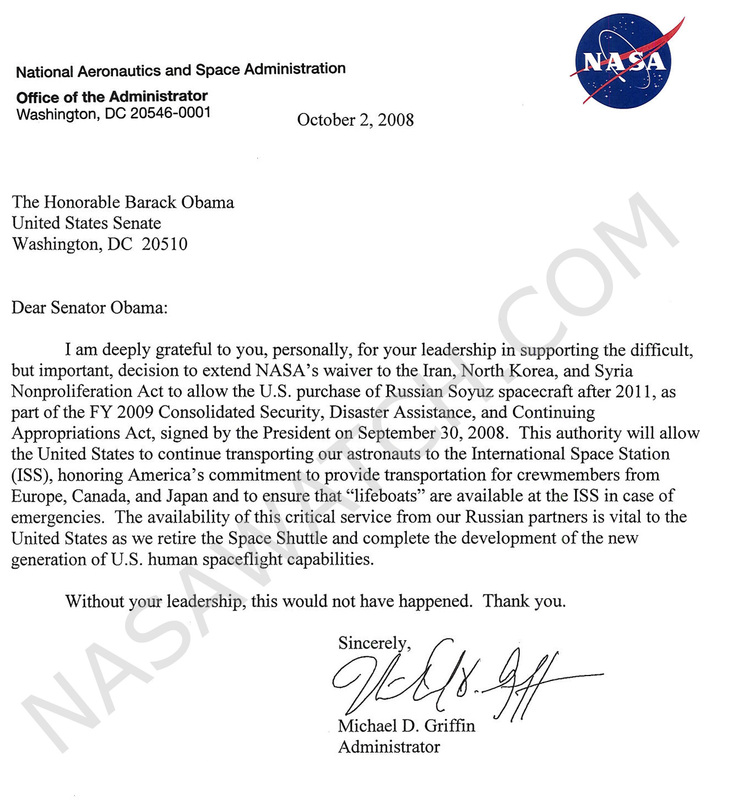 Continue reading Election 2008: Obama Talks (A Little) About NASA. By Keith Cowing on May 6, 2008 8:24 AM. "One thing the presidential candidates haven't been talking about is a space policy. Jeremy Hobson takes a look at whether the candidates have any plans for the final frontier." By Keith Cowing on March 23, 2008 3:06 PM. "Because of the 2008 presidential election, our nation's human spaceflight program is at a perilous crossroad. While Hillary Clinton, Barack Obama and John McCain all have made allusions to supporting the program, none has made it a priority. In fact, in late 2007 Obama went on record as saying he planned to pay for his $18 billion education plan by taking it out of the hide of NASA. In defending his desire to delay the Orion and Ares programs (the next generation crew spacecraft and rockets), he stressed, "We're not going to have the engineers and scientists to continue space exploration if we don't have kids who are able to read, write and compute." By Keith Cowing on March 10, 2008 1:24 PM. "During the question-and-answer portion of an event at a recreational center here, Obama was asked about the nation's space program. "I grew up on Star Trek," Obama said. "I believe in the final frontier." But Obama said he does not agree with the way the space program is now being run and thinks funding should be trimmed until the mission is clearer. "NASA has lost focus and is no longer associated with inspiration," he said. "I don't think our kids are watching the space shuttle launches. It used to be a remarkable thing. It doesn't even pass for news anymore." Continue reading Election 2008 Update 10 March 2008: This Does Not Sound Hopeful. By Keith Cowing on March 7, 2008 9:30 AM. NASA caption: "Images taken of the Mitt Romney tour at KSC are not, in any way, intended to reflect the endorsement of any candidate by NASA. These images were taken during a tour that is typically provided to other VIP's. 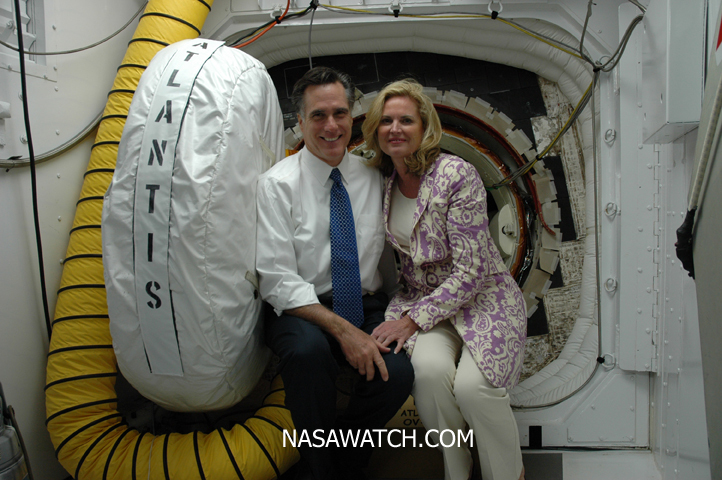 NASA has not authorized the use of these images for campaign purposes and has obtained a commitment from the Romney campaign NOT to use these images for campaign purposes. These images are being released in response to FOIA requests." Editor's note: Click to enlarge image. Isn't it a little odd that most people who are seen in this location are required to wear bunny suits and caps - and yet politicians and their spouses are not? [see comments below as KSC folks correct my assumptions regarding bunny suits - but not about the special access granted to Romney]. Let's see how NASA answers my FOIA request as to what constitutes a "VIP" and what the process is for evaluating and approving (or denying) requests for these personal tours and photo ops - conducted at taxpayer expense. Continue reading Mitt and Ann Hold Hands at Pad 39A. By Keith Cowing on March 3, 2008 9:44 AM. "In the countdown to Tuesday's Texas primary, the candidates still in the race are positioning themselves as astronauts' best friends -- but what they would actually do for manned space travel once elected remains up in the air. Under President Bush's current plan, the space shuttle will be retired in 2010. And with every candidate coming to Texas and professing devotion to NASA, space-watchers are trying to determine what the candidates actually will do when faced with a reeling economy and a record federal debt." "Advocates of NASA's plan to return to the moon are concerned that Democratic presidential candidate Barack Obama has said he will raid NASA's budget to fund education. While the issue of space exploration hasn't gotten much attention this campaign season, it is a topic on which the candidates do differ." By Keith Cowing on March 2, 2008 7:49 PM. "Hillary will double NASA's and FAA's aeronautics R&D budgets as part of her plan to reverse the Bush administration's war on science. She will pursue a balanced strategy of robust human spaceflight, expanded robotic spaceflight, and enhanced space and Earth science activities. She will speed development, testing, and deployment of next-generation launch and crew exploration vehicles to replace the aging Space Shuttle program." By Keith Cowing on March 1, 2008 12:00 AM. "Many space constituents are publicly critical of the Obama campaign for campaign rhetoric that is less overtly supportive of the status quo of the US space program than that of the Clinton or McCain campaigns. However, to this constituent of space, Obama's ambivalence makes him THE MOST ATTRACTIVE Presidential candidate in this campaign. Why?" By Keith Cowing on February 29, 2008 9:16 AM. Obama: "I've got a strong belief in NASA and the process of space exploration. I do think that our program has been stuck for a while - that the space shuttle mission did not inspire the imagination of the public - that much of the experimentation that was done could have been conducted not necessarily with manned flights. I think that broadening our horizons - and looking at a combination of both unmanned satellites of the sort that we saw with the Jupiter launch - but also looking at where we can start planning for potential manned flights. I think that is something that I'm excited about and could be part of a broader strategy for science and technology investment ... The only thing I want to say is that I want to do a thorough review because some of these programs may not be moving in the right direction and I want to make sure that NASA spending is a little more coherent than it has been over the last several years. By Keith Cowing on February 28, 2008 8:53 AM. "Clinton pointed out that Hillary Clinton places more of an emphasis than Obama on human space travel. "This is the center of American space travel," he said of Houston and the Johnson Space Center. "Sixteen thousand (local) jobs -- and a lot of America's future -- rely on this." "He also emphasized her commitment to manned spaceflight. About 100,000 people in the Houston area work for NASA's Johnson Space Center or related industries." em>"Hillary has always supported the manned space program just as I did when I was president," he told a crowd of over 250 who gathered in a picturesque neighborhood park in a Houston suburb today. "Her opponent says we should downgrade man space travel and upgrade robotic travel." By Keith Cowing on February 24, 2008 4:14 PM. "It wasn't in primetime. In fact, it wasn't broadcast at all. The audience wasn't hand-picked to equally represent the candidates. But a weekend debate at the American Association for the Advancement of Science between science advisors to the Hillary Rodham Clinton and Barack Obama campaigns was strikingly similar to forums between the candidates." "Alec Ross, a technology entrepreneur and adviser to Obama, focused on his candidate's plans to expand broadband and technology infrastructure to all Americans. He also hinted that within weeks Obama would unveil a new plan for NASA and space exploration." "Clinton took the stage at about 9:40 p.m. and spoke for about 30 minutes. She touched on usual campaign themes, including affordable health care for all Americans and bringing home the troops from Iraq. She also hit on a local note, pledging to keep funding NASA. "I believe we need to keep funding our next generation of spacecraft," she said." "Obama agreed that NASA, which employs thousands of Houston-area voters who work at or with the Johnson Space Center, should be a tool for inspiring the nation. But, he said, the next president needs to have "a practical sense of what investments deliver the most scientific and technological spinoffs -- and not just assume that human space exploration, actually sending bodies into space, is always the best investment." By Keith Cowing on February 17, 2008 6:28 PM. "I intend to pursue an ambitious agenda in both space exploration and earth sciences," Clinton said. "I want to support the next generation of spacecraft for a robust human spaceflight program." Obama agreed that NASA, which employs thousands of Houston-area voters who work at or with the Johnson Space Center, should be a tool for inspiring the nation. But, he said, the next president needs to have "a practical sense of what investments deliver the most scientific and technological spinoffs -- and not just assume that human space exploration, actually sending bodies into space, is always the best investment." By Keith Cowing on February 12, 2008 3:50 PM. "In 1962, Glenn, a Marine pilot, was the first American to orbit the Earth, becoming an instant national hero. In 1998, shortly before retiring from Senate after 24 years, he became the world's oldest astronaut, returning to space aboard the Shuttle Discovery at age 77. Glenn briefly sought the Democratic presidential nomination in 1984. "I am deeply honored to have the support of Senator Glenn, a true American hero," Clinton said. "With his help, we'll bring our message of change across Ohio." By Keith Cowing on February 8, 2008 2:34 PM. "Last night, Michael Laine and I went to see Hillary campaign along the Seattle waterfront in a cruise line terminal. I squeezed underneath some bleachers to get to the VIP area and wiggled my way right up next to the disabled people and seniors. Then, when she was in the middle of her speech, I shouted: "Send Astronauts to Mars!" using a Hillary sign as a megaphone. She faltered, and continued talking about technology and innovation." Debate Questions: Worth the Effort? By Keith Cowing on February 1, 2008 12:00 AM. Editor's note: Well, there were no space questions asked in the Republican debate. But you can still vote for questions to be asked of the Democratic candidates on Thursday evening here. As it happened, no space-related questions were offered for final vote to be asked of Sen. Clinton. However, two space-related questions were among the finalists offered for voting for Sen. Obama. Editor's update: Well, there were no space questions asked in the Democratic debate either. Was it worth your collective effort? Two space questions did make it to the top of the heap such that people could vote on them tonight. That is certainly a first - and there was the preponderance of space questions that managed to hold onto top positions for weeks on Politico.com - also unprecedented. But to me, the most important thing was a demonstration - by all of those people who submitted and voted for space-related questions - that space exploration advocates could exert this common surge of effort and help raise the issue of space exploration in a way that has not been seen in the past. Neither party has picked a nominee. And there is still a general election after they do. The opportunities to exert similar - and perhaps greater influence will continue. "I'm proud of what has happened, and I feel encouraged that sustaining our efforts throughout this election and beyond will bear greater fruits. I pledge to you all that I will continue my efforts running actionforspace.com to make it easier for you to have an impact on the future of the space exploration. I look forward to the continued help and participation for you all. Thanks for your incredible response for the debates in Los Angeles." Continue reading Debate Questions: Worth the Effort?. By Keith Cowing on January 31, 2008 7:51 PM. "Blogs such as Space Politics and NASA Watch, and organizations such as the Mars Society, keep a close eye on every utterance by a candidate on space policy. They instruct their audience how to contact the campaigns and even coach readers on how to get a space question inserted into a presidential debate. And they are being heard. "It's a small but vocal group, and they've reached out from the beginning," says the Obama staffer. "I'm impressed with the grassroots effort," adds Lori Garver, a Washington, D.C., space consultant and former NASA official who advises Obama's chief rival, Senator Hillary Clinton (D-NY). "They've done more than all the sophisticated lobbyists." By Keith Cowing on January 29, 2008 8:21 PM. "Dear Space Advocate, This week, the presidential candidates will be at the podium again discussing the significant topics of our nation, and YOU have a chance to ask about what's important. As a supporter of space, this is your opportunity to get questions about Space Exploration at the forefront of the debate. Please check out the following link: http://capwiz.com/spaceadvocate/utr/1/OSTZIARNGS/ATHLIARRAS/1699563546, and vote for your favorite question, or submit one of your own. Questions about candidates' views on Space Exploration have been in the top 10 for over a week. Let's keep these on the radar. Be sure to check out the "most popular" area in both the Democratic and Republican section to see the specific question and submit your vote. SpaceAdvocate.com is current undergoing maintenance at this time. However, you CAN make a difference by making your voice heard this week. Cast your vote or submit a question.... TODAY! Sincerely, SpaceAdvocate.com and the Coalition for Space Exploration"
There is one small problem with this. If you go to SpaceAdvocate.com you will see that it is obviously no longer being operated by the Coalition for Space Exploration. Rather, a check of domain records shows that it is owned by some guy in Ankara, Turkey. I'm not certain how the Coalition folks could call this goof-up "maintenance" when they apparently have lost control of one of their prime websites. By Keith Cowing on January 29, 2008 4:34 PM. "[John] Benac's call-to-arms read in part: "[W]e have a tremendous opportunity to put Mars on the political map for the presidential candidates. I have submitted a question for the Republican and Democratic debates that are happening in Los Angeles on January 30th. The way that this debate works is that people submit and vote for the questions that they like online, and the candidates are asked the ones with the most votes. Please tell everyone you think would act on this." Benac's plea to "put Mars on the political map" was quickly picked up and reposted by the Mars Society and the Web site NASAWatch.com, driving more traffic to the CNN/Politico.com Web site, resulting in the posting of new questions and votes for favorites." By Keith Cowing on January 28, 2008 10:48 PM. Editor's note: I did an interview earlier today with CNN about the reentering NRO satellite that aired on CNN Moneyline this evening. I am taping an interview with Fox News tomorrow about space and the 2008 election. By Keith Cowing on January 28, 2008 10:39 AM. "John McCain has been my friend for over 25 years -- and over that span of time in the varied leadership roles I have held, I have witnessed John's passion for doing the right thing on behalf of and as a friend to all Americans. I am proud to support him for president," said Chancellor O'Keefe. "John McCain personifies the depth of character and integrity we need in our next president. His candor, service and sacrifice, and leadership experience in every crucial debate over the last 20 years will serve to inspire the next generation of leaders to serve causes greater than their own self interest." Stand and Be Counted: Only A Few Days Left! By Keith Cowing on January 28, 2008 12:00 AM. Editor's note: Don't forget about the 30/31 January Democratic/Republican debates. They are now just days away. These are the last major televised debates before Super Tuesday. You still need to go to this link at Politico.com to submit/vote on space questions. The frequency of space questions has dropped off and space questions are starting to slip in rankings. I have no idea when they will shut this off. Waste no time: add new questions, go to "most popular" for each party and make sure you have voted for the topic questions. Get your friends and family members to vote. And, if you are so inclined, you might want to vote at work, at home, at Starbucks, from your cellphone ... tell your spouse and kids to vote ... we need to use the same tricks that other "interests" use i.e. vote early - and often - and do so strategically. You need to keep at this folks. Other "interests" have discovered this web page and are having an effect. This is a chance to make certain that the topic - and the veracity of its supporters - is known. These last few days are crucial. You have done a stellar job thus far - we can't let this opportunity slip as we head toward the home stretch. As of 12:29 AM EST we are # 2, 3, 5, 6, 7, 8, 9, 10, 11, 12, 13, 14, 15, 16, 18, 20, 22, 24, 25 on the Democratic side - yet we are only #5, 8, 13, 15, 19, 20, 22, 23 on the Republican side. WE ONCE WERE #1 ON BOTH SIDES. WE NEED TO TAKE OVER THE DISCUSSION. Otherwise, just sit down and shut up. You had your chance. By Keith Cowing on January 27, 2008 10:45 PM. "John McCain believes curiosity and a drive to explore have always been quintessential American traits. This has been most evident in the space program, for which he will continue his strong support." "Curiosity and a drive to explore have always been quintessential American traits. This has been most evident in the space program, which continues to show great advances in human knowledge. However, we are fully aware of the inherent risks and costs of space exploration, and the need to mitigate them wherever possible. Based on this knowledge, let us now embark upon this great journey into the stars to find whatever may await us." By Keith Cowing on January 27, 2008 12:44 PM. "A month ago, I wouldn't have thought this the case, but (space exploration) is sort of in the candidates' face right now," said Keith Cowing, a former NASA astrobiologist who runs the Web site NASAwatch.com. "It seems as if something is happening (with space) and that hasn't been the case in years. "Much of the political discussion centers on space exploration as a technology and education issue, Cowing said. "If you read some of the position papers carefully, then you see space and exploration as topics that are also linked to other aspects of technology development, balance of trade and education," Cowing said." 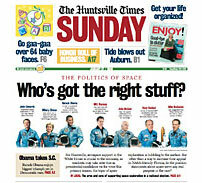 Editor's note: Check out the front page of today's (27 Jan) Sunday Huntsville Times. Also, the last line in this story, although attributed to me, was not something that I said. This error is being fixed by the Times. By Keith Cowing on January 26, 2008 9:04 PM. "The U.S. Presidential primaries season is now in full swing, and debates among the candidates are taking place regularly before millions of viewers. It is a unique opportunity to push space topics onto the national political agenda. And you can help. Here's how: The sponsors of the debates are inviting the public to submit questions to the candidates online http://dyn.politico.com/debate/." By Keith Cowing on January 26, 2008 11:24 AM. "He told them a Giuliani presidency will return America to the dominance it has lost in space. "The U.S. will be the first nation that puts somebody on Mars," he said. "We're not a limited people. We're not a people who think small," he told them. "We're here because we came from people who had grand visions." "Campaigning in his make-or-break state of Florida last week, Mr. Giuliani released a statement promising to "make space a priority." Apparently, America is facing a crisis far greater than health care or education reform: when the current fleet of space shuttles is retired in 2010, it's going to take as much as five years--five years, people!--before we can send another guy into orbit." By Keith Cowing on January 24, 2008 12:17 AM. "Tomorrow, January 24, all space supporters in Florida: at 6:45 p.m, Governor Romney attends a pre-debate rally at Bogart's Bar & Grille: Muvico Palace 20, 3200 Airport Road, Boca Raton, FL 33431 Go get yourself a burger, sidle up to good 'ole Mitt, and tell him why he needs to give NASA a couple billion more dollars. Tell him what effect if will have on your vote. He seems like a nice enough guy to talk to." By Keith Cowing on January 23, 2008 10:58 AM. "For the first time in decades, space policy is emerging as a presidential campaign issue and, political strategists say, could become a decisive factor in the race to the White House. In the run-up to Florida's Jan. 29 primary, candidates have begun to talk about their views on the future of human space exploration. On Friday, former New York Mayor Rudy Giuliani stopped at Kennedy Space Center to pledge he would give NASA the money it needs to return Americans to the moon and go to Mars. On Monday, former Massachusetts Gov. Mitt Romney followed suit." "Barack Obama is opening up a campign office in Huntsville in a few hours! Go there and tell him (or his campaign people) that his space policy needs to be revised!" By Keith Cowing on January 20, 2008 12:25 PM. "I am going to be hosting a Democratic presidential debate on Monday, January 21, in Myrtle Beach, South Carolina"
Editor's 20 Jan note: Wolf Blitzer just (11:44 am EST) read a space-oriented question on the air at CNN selected from those that have been submitted to this web page. Lets see if you can give him some more! And don't forget about the 30/31 January Democratic/Republican debates. Go to this link at Politico.com to submit/vote on space questions. The frequency of space questions has dropped off and space questions are starting to slip in rankings. You need to keep at this folks. Editor's 20 Jan note: Rudy Giuliani was on CNN (12:23 pm EST) with Wolf Blitzer and made a fleeting mention of "having access to our space shuttle" as he talked about being in Florida. By Keith Cowing on January 19, 2008 6:37 PM. "Mitt Romney won the Nevada primary this morning. He also accepted the same invitation the Giuliani had acted on yesterday to meet with the Economic Development Council of Floridas Space Coast." "Giuliani stated boldly and unequivocally today his commintment to send humans to the Moon and Mars, among other things." "Next up is Mitt Romney. The former Massachusetts governor plans to visit KSC on Monday for a closed tour and then meet with the Economic Development Commission of Floridas Space Coast, which also lobbied Giuliani." By Keith Cowing on January 18, 2008 12:24 AM. Editor's 14 Jan note: If you are wondering why the presidential candidates don't spend more time talking about space exploration, here's your chance to try and change that situation and toss questions at them. Go to this link at Politico.com and submit a question to the Democratic and Republican candidates for the CNN/Politico/LA Times debates at the end of the month. Imagine what would happen if they had a thousand questions from NASA Watch readers submitted ... its time for y'all to put up or shut up. Send in a question. Send in more than one question. "This is clearly not random chance. NASA Watch, a private website, ran a note about the website two days ago and it appears the readers (and likely the reader's friends, families, and associates) took this idea and ran with it." Editor's 17 Jan a.m. update: Space questions continue to do well. There are still 2 weeks until the actual debates- so the trick now is to keep the momentum going. Vote for space questions, keep submitting your own, and try and focus on a single, clear question and avoid long speeches on one narrow topic, etc. Editor's 18 Jan a.m. update: It looks like activity has slacked off. The number of space-oriented questions has fallen from the top portion of the list - most notably on the Republican side. Things are better on the Democratic side but there has been erosion there as well. As best I can figure it there needs to be a constant influx of new questions while people vote for the older ones. The easiest way to do this is to check the "most recent" link several times a day and go down and click on all of the space questions you like. This way you don't miss any. In addition, going to the "most popular" page usually only works for new visitors (or for those of you using another computer). In essence: perseverance, new questions, and new people are required to keep this up. You have done a great job thus far - keep at it! "The surge followed an appeal from NASA Watch, a private website, encouraging space supporters to flood the debate website with questions about space. The request appears to have struck a nerve as NASA Watch aficionados and other space fans came out of the woodwork, inundating the website with inquires about the candidates' views on missions to the moon and mars, robotic exploration and climate change." "When you go to the site, you will see that numerous space-related questions already have been submitted, in large part thanks to the efforts of Keith Cowing, editor of the website NASAWATCH." Continue reading Stand and Be Counted - It Seems To Be Working. By Keith Cowing on January 15, 2008 7:53 PM. "Science and Engineering Indicators, published by the National Science Board, provides a broad base of quantitative information on the U.S. and international science and engineering enterprise." page 7-13: "Relative to other topics, including S&T-related topics, interest in space exploration has consistently ranked low both in the United States and around the world. Surveys in Europe, Russia, China, and Japan document this general pattern." page 7-26/27: "Although support for federal research investment is at historically high levels, other kinds of federal spending generate even stronger public support (appendix table 7-18). Support for increased spending is greater in numerous program areas, including education (73%), health care (72%), assistance to the poor (68%), environmental protection (67%), and Social Security (61%). Scientific research ranks about on a par with mass transit (38%) and well ahead of Science and Engineering Indicators 2008 7-27 space exploration (14%) and assistance to foreign countries (10%) in the proportion of the U.S. population favoring increased spending." By Keith Cowing on January 15, 2008 3:47 PM. "Watch the Jan. 15th 2008 Democratic Presidential Candidates' Debate the first debate since the New Hampshire primaries on MSNBC TV and MSNBC.com to see if your question is asked." By Keith Cowing on January 11, 2008 12:05 AM. "Over the decades, the National Aeronautics and Space Administration (NASA) has embodied the adventurous spirit that lifted this nation to greatness and inspired people around the world. Barack Obama believes that the United States needs a strong space program to help maintain its superiority not only in space, but also here on earth in the realms of education, technology, and national security. Over the years, NASA technology has been applied to improve everything from computers and medical technology to baby formula and automobiles. Work done at NASA, whether here on earth or in outer space, impacts the daily lives of all Americans." By Keith Cowing on January 9, 2008 8:02 PM. Editor's note: Reliable sources report that Rudy Giuliani's visit to the KSC area tomorrow (Wednesday) is almost certainly being put off for a week - perhaps until 18 January. Editor's Update: Just confirmed - he will be at KSC next week on 18 January. By Keith Cowing on January 4, 2008 10:31 AM. Editor's note: Last night's Iowa election results left several messages (to me at least). For both parties, it seems that change is in the air and that manufactured candidates pushed by big party interests did not go over all that well (at least in Iowa). For the Republicans, it is unclear whether Huckabee's win is a flash in the pan or the beginning of a trend. For the Democrats, Obama's win over Hillary Clinton (Oh yes Edwards beat her too) signals a potential tectonic shift whereby traditional constituencies that common thought would suggest go for/against a female candidate and for/against a person of color where turned on their heads. Also "experience" and "change" seemed to trade places in terms of importance to voters. Again, we have only one data point thus far: Iowa. The weeks ahead will tell whether these two trends - together or individually will pan out into trends and/or paradigm shifts. "Obama believes we should continue developing the next generation of space vehicles, and complete the international space station. While Obama would delay plans to return to moon and push on to mars, Obama would continue unmanned missions, and use NASA to monitor the forces and effects of climate change, support scientific research, and maintain surveillance to strengthen national security. Obama also believes we need to keep weapons out of space." NASA pumps some -- let's see, how many -- $5 billion into Florida's economy. Some of you were late because you didn't have one, by the way. Or whether it's the medical technologies that saved many of our lives or the lives or our families, it's the direct result of the space program, and we need to put more money into science and technology and exploration. Now, whether we need to send somebody to Mars, I don't know. But I'll tell you what: If we do, I've got a few suggestions, and maybe Hillary could be on the first rocket to Mars." Given Obama's initial and then restated policies on space exploration, and those expressed by Huckabee, what do their respective wins (and possible future wins) mean for space policy? Do they mean anything at all? Continue reading Iowa Results and Space Exploration. By Keith Cowing on January 3, 2008 12:23 PM. "At first glance, former Arkansas governor Mike Huckabee and NASA chief Michael Griffin don't have much in common. Huckabee is no rocket scientist, and Griffin is no presidential aspirant. But their respective recent forays into the field of communications illustrate a common point: Sometimes it is easy to look dumb trying to be clever." By Keith Cowing on December 13, 2007 6:38 PM. Editor's note: STS-90 payload specialist Jay Buckey is running for the Democratic senate nomination in New Hampshire. One of the things his campaign is offering in exchange for contributions are these little space shuttles. By Keith Cowing on November 30, 2007 11:21 AM. "Presidential campaigns should publicly express their support of NASA's Constellation Program to ensure America's leadership in space exploration as well as boost education, AIA President and CEO Marion Blakey said. The exploration program, which will return astronauts to the moon and explore Mars and beyond, should not be delayed under any circumstances since there is already a manned spaceflight gap looming." Space Advocacy Groups: Not Ready For Prime Time? By Keith Cowing on November 29, 2007 2:05 PM. Editor's note: Last night a Mars Society member (and Hukabee supporter) managed to get a video question inserted into the Republican Presidential debate. Yet, as of 2:00 pm EST neither Planetary Society, the National Space Society, the Coalition for Space Exploration, the Space Exploration Alliance, or even the Mars Society has any mention whatsoever of this question being asked last night. Gee, I had something online 10-20 minutes after the words were spoken - and I am not especially gifted in regard to web stuff. It is now 14 hours later and there is not a peep from the space advocacy community. I have to ask, why is anyone (campaign staff, voters) going to pay any additional attention to groups that support an issue when they cannot get off of their collective butts to even make note of (and capitalize upon) a potential breakthrough in a national debate? By Keith Cowing on November 28, 2007 10:09 PM. Editor's note: A video (below) from a Mars Society member (complete with logos) managed to get in on the CNN/YouTube debate among Republican presidential candidates. In responding, Gov. Huckabee was rather supportive of space exploration and its benefits to our society and economy. He even wanted to send Hillary Clinton to Mars. Rep. Tom Tancredo said that there is not enough money to spend on a Mars mission (transcript below). Editor's note: According to a NASA Watch reader, the person who submitted this question, Steve Nielson, has a pro-Huckabee website. Continue reading Today's Video: Space Makes It Into The Presidential Debate. By Keith Cowing on November 28, 2007 6:42 AM. "Democratic presidential candidate Barack Obama's education policy is causing a stir ... but not all in a good way. Advocates for space exploration are noting with dismay that he'd take billions of dollars from NASA to pay for the educational programs he'd like to expand." By Keith Cowing on November 26, 2007 10:22 PM. "Democratic presidential candidate Barack Obamas education policy is causing a stir but not all in a good way. Advocates for space exploration are noting with dismay that hed take billions of dollars from NASA to pay for the educational programs he'd like to expand." By Keith Cowing on November 23, 2007 12:12 PM. "The major presidential candidates pummel each other daily on issues ranging from the Iraq war to health care. But when it comes to President Bush's ambitious initiative to send humans back to the moon and on to Mars, Sen. Hillary Rodham Clinton (D-N.Y.) is all but alone in staking out a formal position -- and it's one that lends support to key aspects of the president's effort. She initially outlined the need for a "robust" human spaceflight program last month during a Washington speech on science policy, despite being broadly critical of the Bush administration's record on scientific issues." By Keith Cowing on November 20, 2007 12:16 PM. "Barack Obama is planning to unveil an education plan today that would make affordable pre-school programs more widely available and offer pay incentive programs for effective teachers. It would also allow schools to lengthen the teaching day or the school year. The $18 billion annual program would be offset by savings and cuts in federal agencies, including NASA. ... The cost of the early education plan would come partly from delaying the NASA Constellation Program for five years ..."
"Though Obama called for a renewed investment in math and science education, his plan would actually pull money from the federal government's greatest investments and achievements in math and science. Obama would delay funding for the NASA Constellation program for five years, though he would maintain the $500 million in funding the program would receive for its manufacturing and technology base, in order to help fund his education policy. The campaign did not say how much money delaying the program would provide." "A spokesman for the Republican National Committee (RNC) criticized the NASA cut. "It is ironic that Barack Obama's plan to help our children reach for the stars is financed in part by slashing a program that helps us learn about those very same stars," said Danny Diaz, RNC spokesman." Editor's note: Let's see, the gap between Shuttle retirement and Constellations' first flight is approaching 5 years. Now Obama wants that to be ten years. I guess that means that the only way for America to reach the ISS for a decade will be aboard Russian spacecraft. That is totally unacceptable. By Keith Cowing on November 14, 2007 4:45 PM. "When told that "Ron Paul consistently opposes taxpayer funding for NASA and wants to eliminate the agency," 61 percent of Republican primary voters said this information would make them less likely to vote for Paul's reelection." By Keith Cowing on October 15, 2007 9:38 PM. "Presidential hopeful Rudy Giuliani on Sunday said preparedness will be key for all crises, even an attack from outer space. During a town hall meeting in Exeter, a young questioner asked the former New York mayor about his plan to protect Earth. "If (there's) something living on another planet and it's bad and it comes over here, what would you do?" the boy asked." By Keith Cowing on October 4, 2007 6:05 PM. - Pursuing an ambitious 21st century Space Exploration Program, by implementing a balanced strategy of robust human spaceflight, expanded robotic spaceflight, and enhanced space science activities. - Developing a comprehensive space-based Earth Sciences agenda, including full funding for NASA's Earth Sciences program and a space-based Climate Change Initiative that will help us secure the scientific knowledge we need to combat global warming. -Promoting American leadership in aeronautics by reversing funding cuts to NASA's and FAA's aeronautics R&D budget." "Fifty years ago, Sputnik marked the dawn of the Space Age and the beginning of a new era filled with new challenges. Fifty years later, there is no single, galvanizing event to steel our resolve and to lift our eyes to the heavens. The challenges we face are more complex and interconnected. From the rise of globalization to the threat of global warming. These challenges require big ideas and bold thinking." Editor's note: What is surprising to me is the extensive portion of the overall speech devoted to space exploration and space policy. I am not sure that any presidential candidate has said this much in public about space in a long time. By Keith Cowing on October 3, 2007 5:24 PM. "Tomorrow morning, Hillary will be giving a speech on her science policy, and we'd like you to attend. After six years of George Bush putting ideology ahead of science, America is ready for a change, and Hillary will lay out her plans to support scientific research and restore the role of science in decision-making. Space is limited and RSVPs are required. RSVP now:"
Editor's note: Word has it that Sen. Clinton will make some very specific and detailed recommendations for the space policy she'd implement as President. By Keith Cowing on July 23, 2007 5:44 PM. "It has long been a complaint of space advocates that presidential candidates spend little or no time discussing their space policy positionsif, in fact, they have bothered to develop any positions on the subject. Space is near the bottom of the list of topics of interest to the electorate in general, and one that is not a swing issue for all but a small handful of voters. It is also rarely a partisan issue, making it difficult for space policy to become more ammunition in the continuous battles between Republicans and Democrats. Thus, even in the current campaignwhich is shaping up to be the longest and perhaps the most contentious in US historytheres scant attention paid to space." By Keith Cowing on May 23, 2007 12:14 PM. "One bureaucrat who felt McCain's wrath was former NASA Administrator Daniel Goldin, who was summoned by McCain in 1999, not long after a $125-million probe crashed on Mars because of confusion over the use of English and metric units. McCain's Senate Commerce Committee had oversight over NASA. "McCain went ballistic the moment Goldin walked into McCain's office," said a participant in the meeting who spoke on condition of anonymity because he still worked in the government arena. "He was shouting and using profanity, saying he was sick of NASA's screw-ups. It went on for a few minutes, and then he kicked Goldin out of the office." Goldin started walking down the hallway but was called back to the senator's office by a McCain aide. "When he came back in, McCain started yelling at Goldin all over again. And then McCain kicked Goldin out a second time before he ever said a word," the source said." By Keith Cowing on May 10, 2007 1:35 PM. "Former New York Mayor Rudy Giuliani will visit Huntsville today for a luncheon fundraiser and a stop at the U.S. Space & Rocket Center. The Republican candidate for president is also making campaign stops in Tuscaloosa and Birmingham. Giuliani is to attend a $1,000-a-plate luncheon and photo op fundraiser at The Ledges in south Huntsville. It is a closed event, said Elliott Bundy, regional communications director for Giuliani's campaign." "Arriving afterward at the Space Center, Giuliani said military research in robotics and bomb detection not only would help in Iraq, but would improve law enforcement here and homeland security." By Keith Cowing on March 28, 2007 6:07 PM. Editor's note: Word has it that Kerry 2004 Space Advisor Lori Garver hosted a dinner at her home in McLean last night for like-minded pro-space Democrats. There are also rumblings that Democratic space wonks are beginning the process of considering the drafting of draft white papers on space policy for an election 18 months away ... stay tuned. By Keith Cowing on February 20, 2007 8:44 PM. "[Republican presidential candidate John McCain] also said he strongly supports missions to Mars and that Florida should continue to play a major role in space exploration. "There's too much invested there. There's infrastructure that's very expensive and very extensive there," he said." This page is an archive of recent entries in the Election 2008 category. Election 2004 is the previous category. Election 2012 is the next category.